What-if scenarios are powerful tools to analyze your strategies and to model the position parameters under certain conditions. What-if scenarios can be applied to strategies' positions and to strategies' charts. 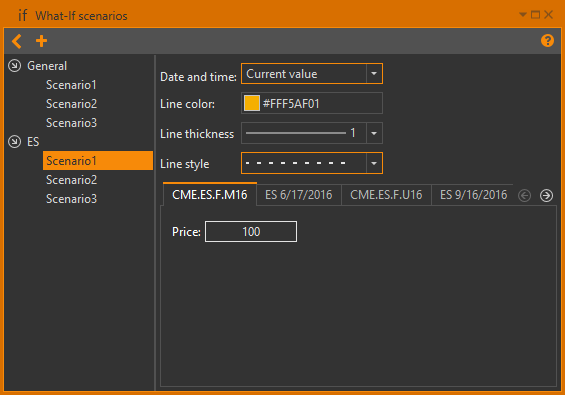 When you choose a scenario the position parameters are automatically recalculated. If a scenario is not set, the form displays the current market values. On an asset – available for the strategies on a certain underlying asset (volatility changes for strikes). To create a new what-if scenario or edit an existing one, click the button on the application toolbar. To view the scenarios list, click the button near the group name. When you click on the specific scenario, its parameters will be displayed in the right part of the form. What-if scenarios list is automatically sorted in alphabetical order. Add a scenario to the What-If manager. Click the Select an asset button. Select the desired asset in the open window. Click the OK button. To search the instrument, enter the value in the Search box and click Enter. The list will display values that partially or fully match the indicated one. Click the OK button or press the Enter key to confirm your input. After that, the new scenario will be created and you will be able to edit it. In order to edit a what-if scenario, select a Generalgroup from the list, and then select the desired scenario. 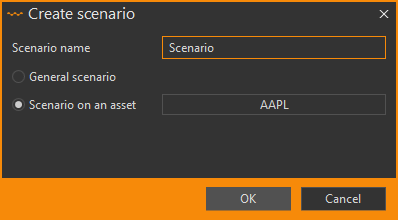 In order to edit a what-if scenario, first select the desired asset from the list. Then click the desired scenario. Option Workshop will create tabs for different series, for example, ES 6/17/2016, ES 9/16/2016. Double-click on the desired cell. 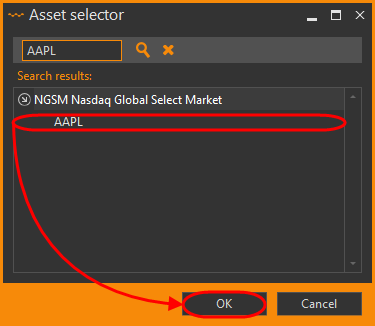 Exact value – enter a decimal number to set fixed volatility. Absolute value – enter a _signed_decimal number to set absolute volatility offset. Relative value – enter a _signed_decimal number with trailing percent sign to set the relative volatility offset. 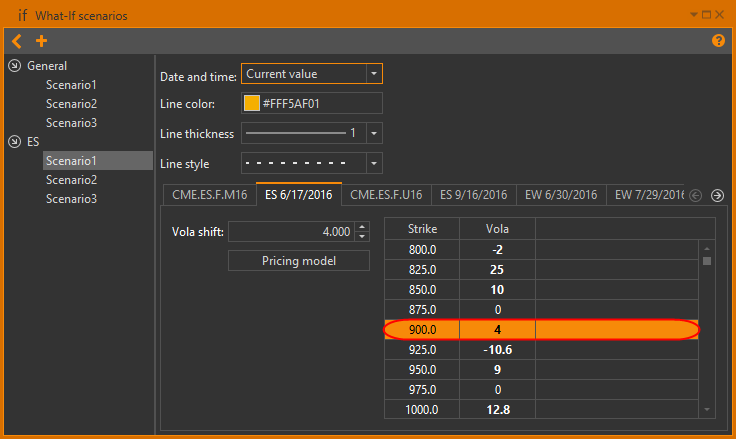 To return to market volatility, enter 0into the text field to disable custom volatility for the current strike. 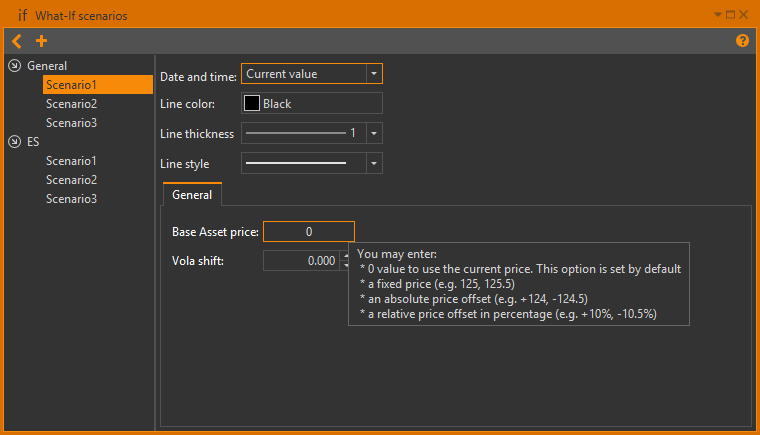 Note that customized volatility values are displayed with a bold font in the table. Values displayed with a normal font represent current market volatility values. 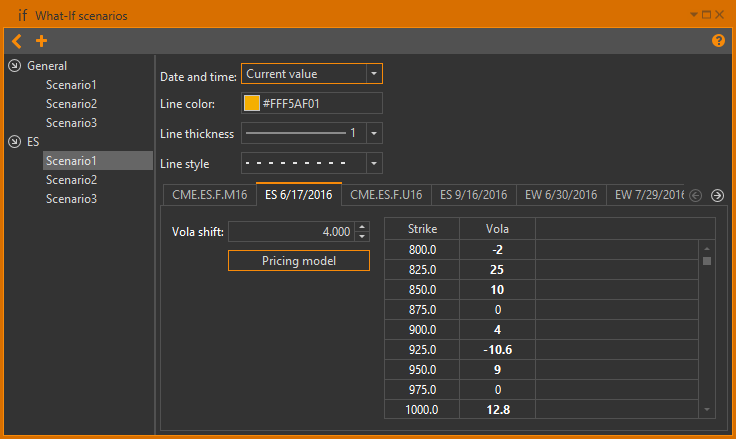 You can select a pricing model for the what-if scenario only from the list of created models for this option series. Check the checkbox and select model from the list. Models cannot be deleted as long as it is being used in what-if scenarios. 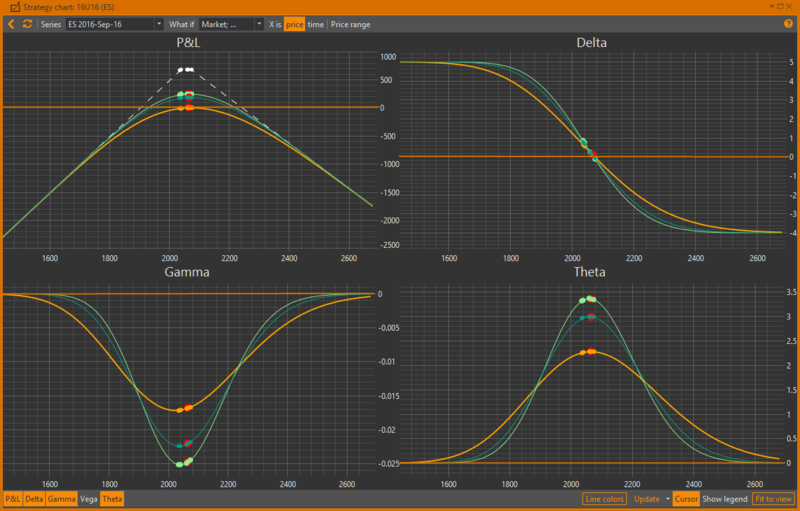 Note that Vola shift and Custom vola options can be used together, thus Vola shift will affect the results of Custom vola, as seen in the formulas above. You may override the current price value for each futures result on the current asset. Current market price – enter 0 value into the Futures price field to disable price overriding. This option is set by default. Exact price – enter an unsigned decimal value to set a fixed future price. Absolute price offset – enter a signed decimal value (positive or negative) to set an absolute price offset. Examples: +124.5, 124.5, +124, -124. Relative price offset – enter a signed decimal value (positive or negative) with trailing percent sign to set a relative price offset. Right-click on its name in the list to open its context menu. Click the Rename command. A Rename scenario dialog will pop-up. Enter a new name for the scenario. Click the OKbutton or press the Enter key to confirm your input. You will get a confirmation dialog, after which the what-if scenario will be deleted. Also, you can delete what-if scenarios by pressing the Delete key on the keyboard. Select one or more strategies from the desired asset. Expand the What-if scenario selector on the toolbar above the positions table. Select the desired scenario to apply. Clicking the Market item returns to the current market price. The scenario will be applied to the positions table and the values in it will be recalculated. Click the Chart button on the toolbar above the positions table. 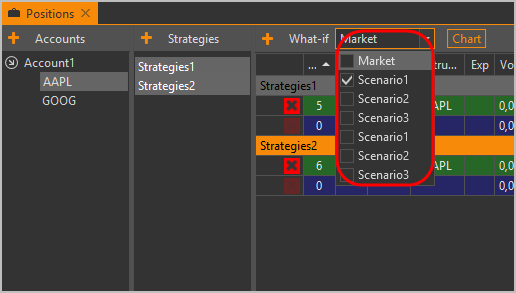 Expand the What-if scenario selector on the top toolbar of the strategy chart window. 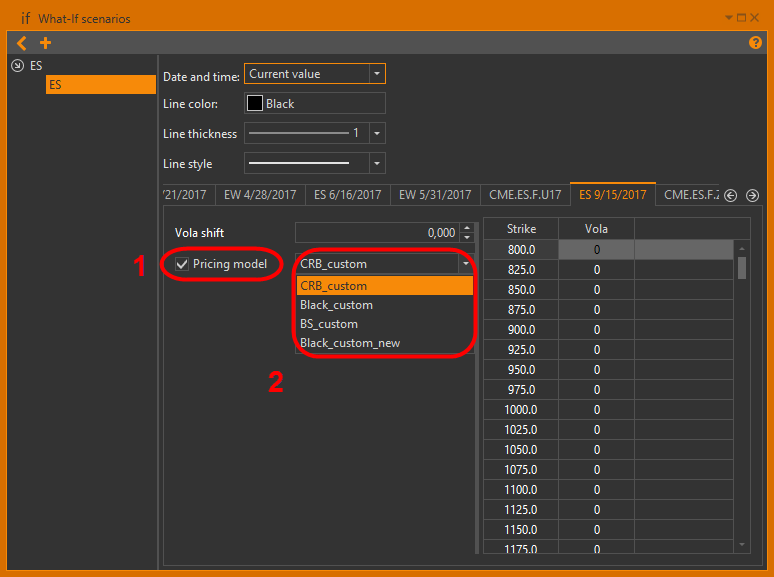 Click on a scenario's name to select or deselect it. Click the button on the top toolbar to refresh the chart lines or click the Click to apply changes pop-up button. All selected scenarios will be displayed in the chart area. Note that there is always a special scenario in the drop-down selector named market. This scenario represents the current market price and will be selected automatically if no other scenarios are selected.